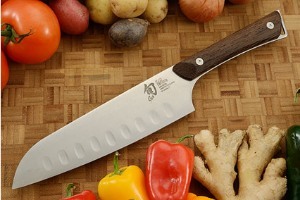 Description: The Shun Kanso 7-in. Hollow-Ground Santoku is a beautiful, Asian-inspired chef's knife that many cooks today have added to their kitchen favorites. A knife of many talents, a santoku easily handles all the basic kitchen cutting tasks. 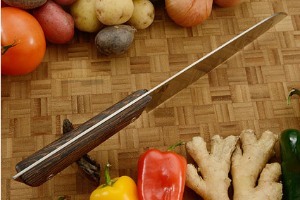 In fact, many people even prefer it to a Western chef’s knife. Slightly shorter than the standard chef's knife, the Shun Kanso Santoku is very easy to maneuver -- even in a smaller kitchen. There's plenty belly curve to enable rocking cuts, which just adds to the knife's versatility. We think you’ll find that this distinctive kitchen knife works beautifully and fits your hand like a glove. The santoku is especially well suited to a down-and-forward cutting motion (push cut). Many cooks swear by their santoku for easy food preparation and top performance. The Shun Kanso 7-in. 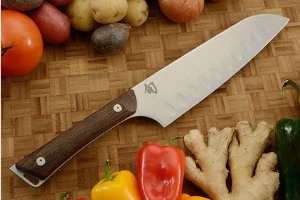 Hollow-Ground Santoku is part of the Kanso series. Kanso is a design principle based on Zen philosophy. It means "simplicity," but simplicity that is achieved by eliminating the non-essential. In Kanso, Shun took away anything that doesn’t matter and kept everything that does: high-performance steel, razor-sharp edge, perfect balance, and precision cutting control. The steel is Japanese AUS10A—highly refined, high-carbon, vanadium stainless steel that takes a razor-sharp edge and holds it longer. Kanso's Heritage finish hides scratches and gives Kanso a rustic look that just improves with age.